While they not as flamboyant as some other chameleons, Jackson’s chameleons (Chameleo jacksonii) are capable of remarkable color changes. When resting and calm, Jackson’s chameleons are most commonly some shade of green -- with or without dark, contrasting splotches. However, when they're cold or when they're acting aggressively, Jackson’s chameleons can display bold colors that include black, yellow, teal and blue. Though humans have created invasive populations in Hawaii, California and possibly Florida over the last few decades, Jackson’s chameleons are historically native to the mountainous forests of east Africa. Unlike the majority of chameleons, which reproduce by depositing eggs, Jackson’s chameleons give birth to live young. 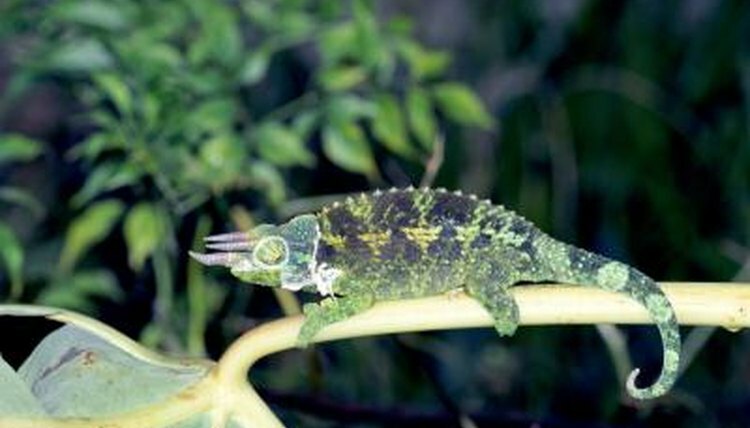 Male Jackson’s chameleons have three horns on their face, which they use to joust with conspecific males in territorial disputes and for breeding rights. Jackson’s chameleons are insectivores who use their long sticky tongue to capture prey. Under the first few transparent layers of skin, chameleons have specialized cells called chromatophores, which are responsible for their color-changing ability. Chameleons have several different layers of chromatophores, and each carries a characteristic pigment. Normally, these pigments are sequestered into tiny vesicles; accordingly, they do not reflect much light, and that color is not visible. When a chameleon’s central nervous system triggers the chromatophore, the vesicles inside release the pigment, which is now free to disperse throughout the cell. As the pigment can now reflect more light, the pigment's color becomes visible. By manipulating different portions of each layer of chromatophores and using pigments from multiple layers at the same time, Jackson’s chameleons can produce complex, blotchy patterns featuring a variety of colors. Contrary to popular perception, chameleons do not use their extraordinary color-changing capabilities for camouflage within their surroundings. When relaxed, Jackson’s chameleons are drab olive to light green in color; this, combined with their flat bodies and cryptic behavior, helps them remain well hidden from predators. However, they will adopt darker or bolder colors to thermoregulate or to communicate with other Jackson's chameleons. Jackson's chameleons primarily change color in response to temperatures or social cues. When cold, Jackson’s chameleons will adopt darker colors to absorb more heat, while high temperatures cause them to lighten considerably. Aggressive or hostile Jackson’s chameleons will display bold colors, including bright green, teal, blue and yellow, in conjunction with threatening body language. Males exhibit the same bold colors and behaviors when attempting to breed with females. Females who are receptive to mating advances display light colors and elevate their tails. If already gravid, or if they're otherwise unimpressed, females display dark colors and gape, hiss or rock back and forth to dissuade advancing males.